Autism is now considered the fastest rising developmental disability in the world, autism prevalence in children rose from 1:150 to 1:110. (Released by Autism and Developmental Disabilities Monitoring (ADDM) Network in 2009). More will be diagnosed with autism than diabetes, cancer and AIDS combined in the coming years. Recognizing the gravity and urgency of this situation, United Nations General Assembly declared April 2 as World Autism Awareness Day (WAAD) in 2008. Autism is a lifelong developmental disability that affects how an individual interprets what he sees, hears, and touches, thereby impairing his understanding and use of language and his adaptation to his environment. Autism is not curable but is treatable. When a child is diagnosed and receives intervention early in life; given the appropriate education and therapy; they can become self-reliant and productive members of society. In the Philippines, almost 1 million Filipino families are estimated to be affected with autism. 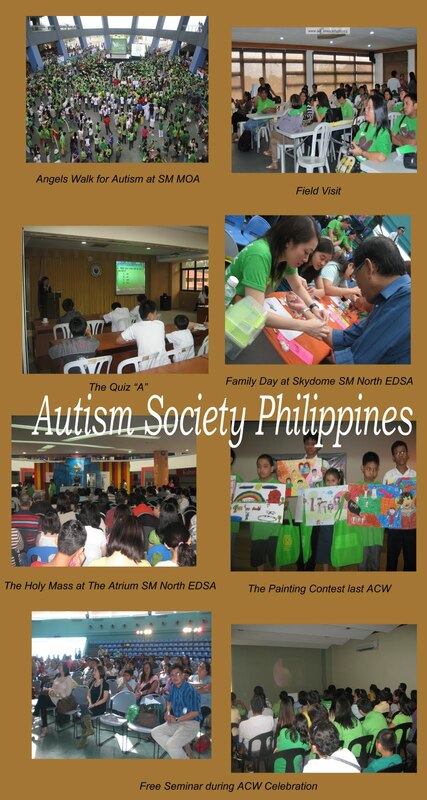 Autism Society Philippines (ASP) has been in the forefront of providing services to families affected with autism. ASP has grown from the 11 mothers who bonded together for the causes of their children in 1989, to more than 7,000 members, with 56 chapters all over the country. Mandated in 1996 by former President Fidel V. Ramos, Presidential Proclamation No. 711 or Autism Consciousness Week aims to promote awareness on autism and the provision of appropriate social services to persons with autism. “Making the Rights Real for Filipinos with Autism” was adopted as the theme for this year’s celebration to give emphasis on the realization of the rights of individuals affected with autism and to support the campaign of the United Nations to give special attention to Persons with Disabilities which comprised 15% of the world’s population according to the 2011 data of the World Health Organization (WHO). Persons with Disabilities are the most vulnerable and marginalized sector of the society. The event is in partnership with SM Programs on Disability Affairs, SM Supermalls, SM Prime, National Council on Disability Affairs (NCDA), Department of Interior and Local Government (DILG), Department of Environment and Natural Resources (DENR), Council for the Welfare of Children (CWC), House of Representatives Committee on Social Services, Buhay Party List, Department of Transportation and Communication (DOTC), Katipunan ng May Kapansanan sa Pilipinas-National Capital Region (KAMPI-NCR), Center for Advocacy, Learning and Livelihood (CALL) Foundation, Department of Social Welfare and Development (DSWD), Philippine Information Agency (PIA), Department of Education (DepEd), Philippines Academy of Rehabilitation Medicine, NORFIL Foundation, Archdiocese of Manila Ministry for Persons with Disabilities (AMMPD), Autism Hearts and Liliane Foundation. Be an Angel for Autism. Support the 16th National Autism Consciousness Week. Be one with us in “Making the Rights Real for Filipinos with Autism”. 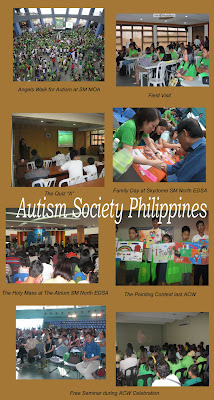 For more information call 926-6941/929-8447 or visit www.autismsocietyphilippines.org or autismsocietyphilippines.blogspot.com.